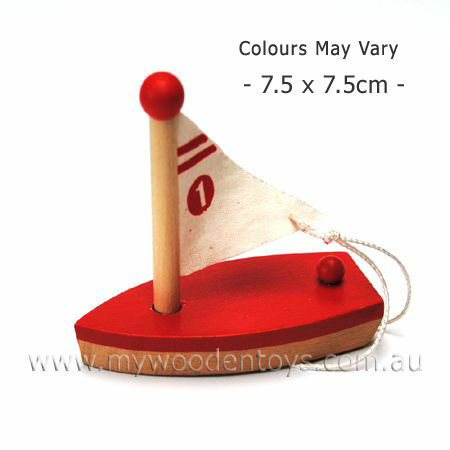 Mini Wooden Sailing Boat is a strong little wood boat with a lovely coloured hull and cloth sail. This small wooden novelty toy is great fun and floats well in the bath. This mini sailing boat is nicely finished and has a number 1 on the sail. A lovely addition to bath time or as a sweet little model to stand on a bedroom shelf. Size: 7.5 cm long x 7.5 cm high x 3.5cm wide. Material: Wood childsafe paint, Cotton sail. We like this because: "Really well made. "